The pincushion thread catcher that my mom gave me years ago is my sewing table’s best friend. Yeah, I know it seems a little grandma-ish but it’s no surprise that I’m a big fan of things that are both clever and cute. This pincushion thread catcher free sewing pattern is an easy beginner sewing project and makes a great DIY gift for any sewer. Convenient, yes? 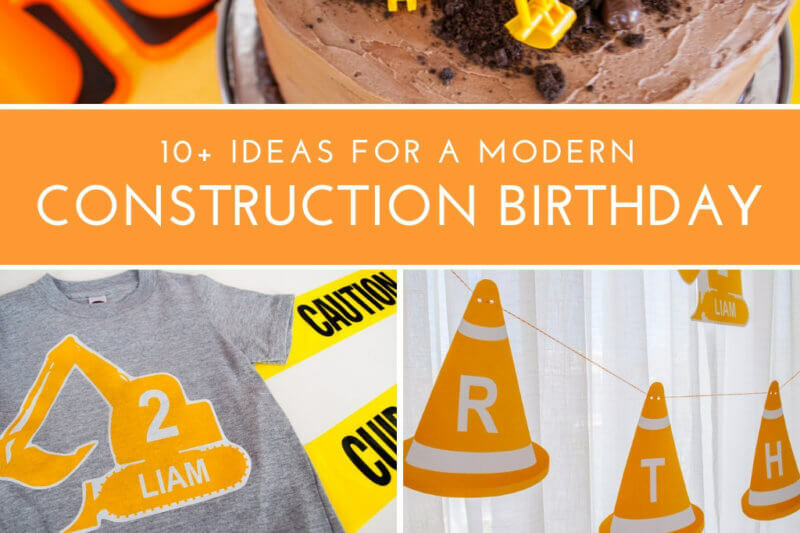 I’m always a big fan of beautifully functional DIY gift ideas. This is a great scrap buster project and wonderful gift idea for any sewer that you can make in just one evening. 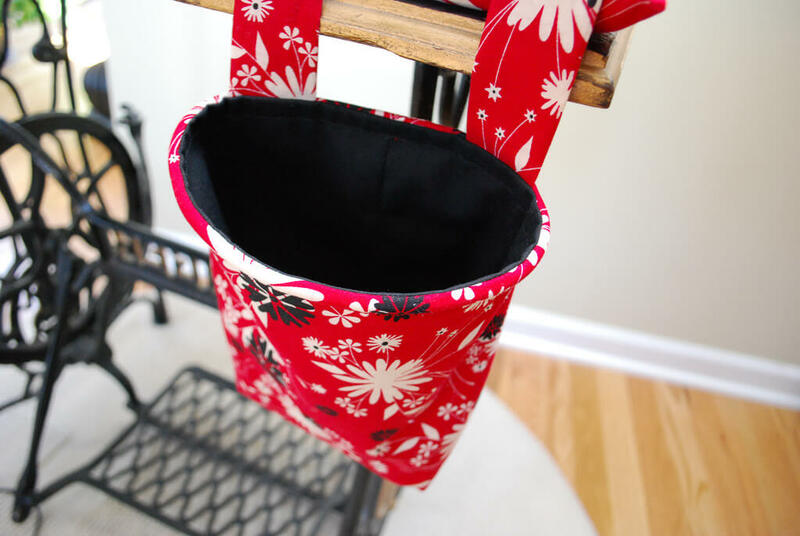 I made this red weighted pincushion thread catcher thank you gift for my friend Susan who let me deeply dip into her fabric stash while getting ready for the 2008 Renegade Craft Fair. Yep, I said 2008. That makes this thank you gift 18 months late. Terrible, I know. But better late than never. I reverse-engineered my mom’s pattern, doubled the pin cushion size, and voila! An easy beginner sewing project and free step-by-step tutorial for how to make a pincushion thread catcher. Keep reading to make your own! NOTE: All seams are 1/2″. 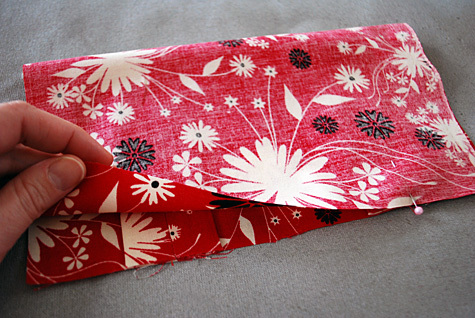 Fold the straps in half and sew a 1/2″ seam. 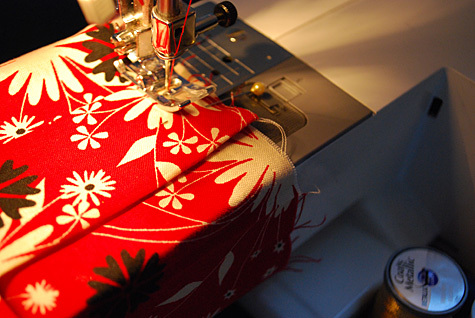 Maneuver the seam to the center and press the seam open. Turn right side out and ensure the seam is on the back of the strap (rather than on one of the sides or the front). Put the pincushion piece face up on your table. 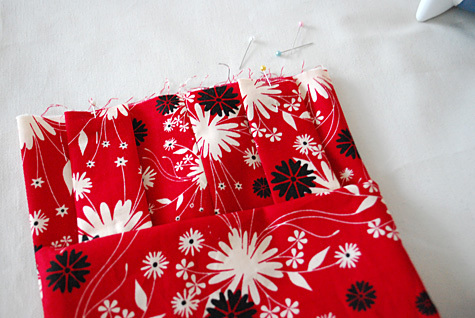 Place the straps 1.5″ from each side of the pincushion piece on one of the 9″ long sides. 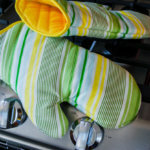 Fold right sides together, sandwiching the two straps inside. 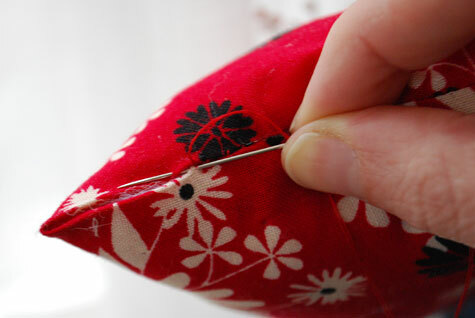 Sew the pincushion shut, leaving about 3″ open on one of the short sides so that you can turn it right side out. 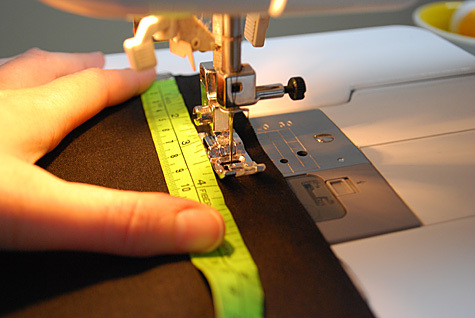 Remember that all seams are 1/2″. Trim the corners a bit but not too close. Turn the bag right side out through the opening. Press your fingers into the corner. Press flat and set aside. 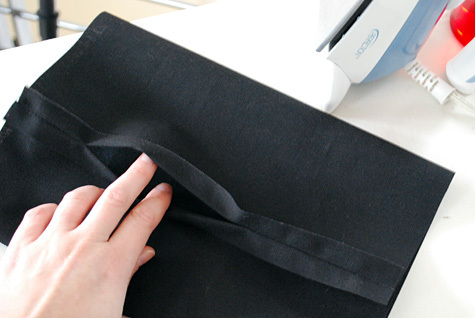 Fold the thread garbage bag in half right sides together. 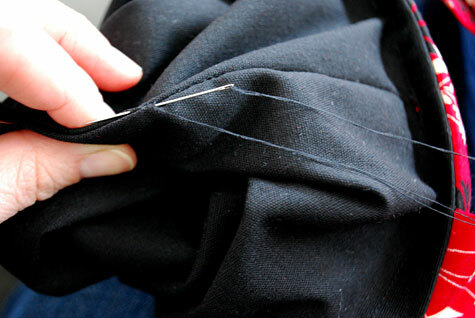 Sew the side seam. 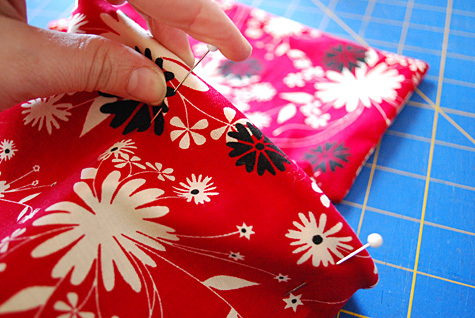 Remember that all seams in this beginner sewing project are 1/2″. Press the seam open and move it to the center like you did above for the straps. 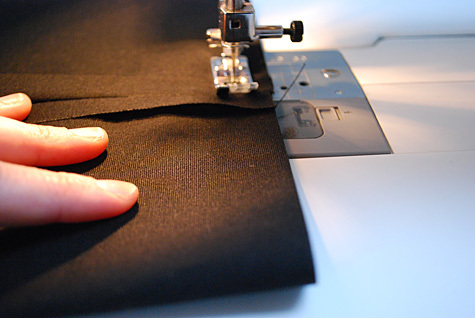 Sew the bottom seam. Make your thread catcher basket bottom by creating a triangle where the side seam meets the bottom. 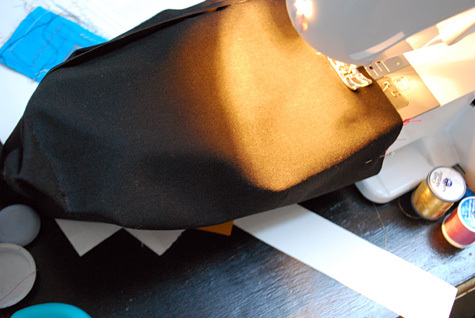 Your triangle should be 1 1/2″ wide with the seam flattened open. Mark with a pencil and sew across the bottom of the triangle. Turn the bag right side out to see how it creates a soft bottom. Basically you do the same thing here as the bag outside with one important difference: You leave a hole in the side seam so that you can turn all of this stuff right side out. Like the bag outside fold right sides together. 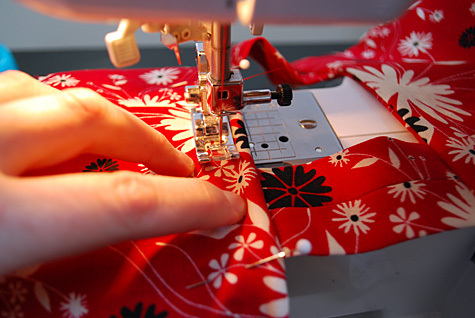 But instead of sewing the entire seam, starting from the top, sew 4″ of the side seam. Backstitch. 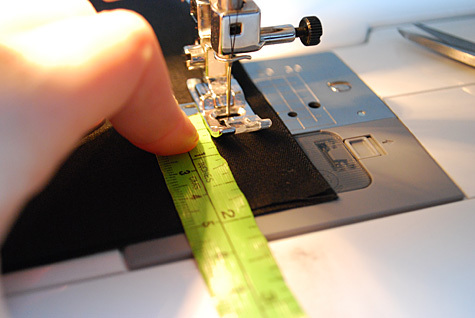 Then go to the bottom and sew 2″ of the sides seam. See the hole? This is important later. Now just repeat what you did for the bag outside to finish off this lining. 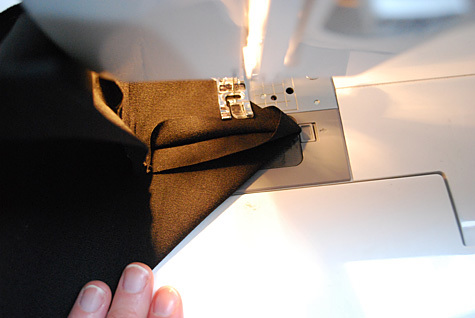 Sew the bottom seam. 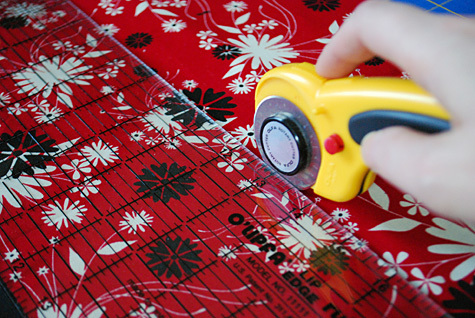 Sew 1-1/2″ triangles on the bottom to create a soft bottom. Stop here though …leave the lining with the right side in, wrong side out. Line up the pincushion straps on the back of the bag. The back of the bag should be facing (touching) the back of the straps (so in other words, the seam-side of the bag and the seam-side of the straps should be touching each other). Sew the straps to the bag. So your bag is right side out and your lining is right side in. This is going to sound weird, but put your bag inside your lining matching up the back seams, and pin. See how the right sides are together? Eventually you’re going to pull this through the lining hole that you made. Make sure your straps are tucked between the lining outside and lining inside. 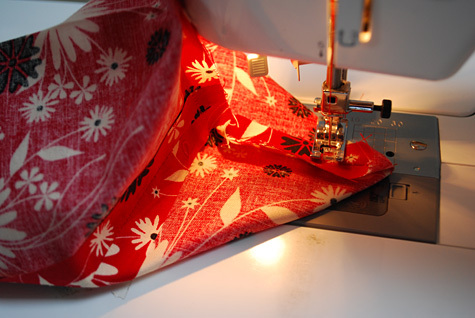 Sew all the way around to attach the bag outside to its lining. Pay no attention to my messy sewing table 🙂 Turn the pincushion right side out through the lining hole. So while this step is optional it helps your thread catcher bag stay open and generally makes the whole thing look nicer. 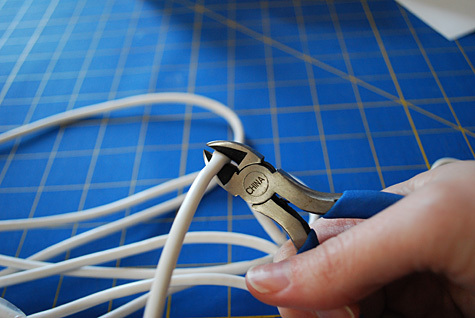 Cut a 17″ piece of plastic clothes line using wire cutters. 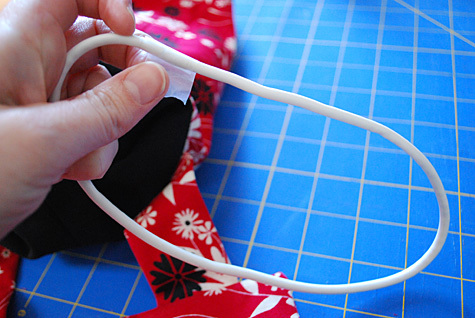 Make a circle with the plastic clothes line and secure raw edges with a piece of tape. 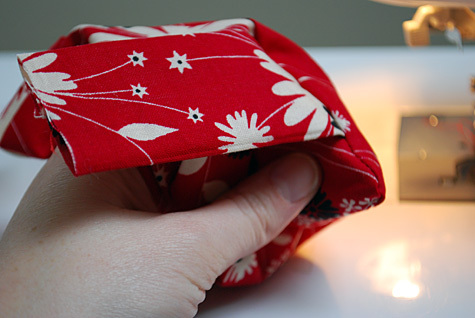 Slip the circle inside the lining hole and work it up to the top of the bag. Secure with pins. I think the thread catcher looks great like this! And now it will stay open when it’s on your sewing table. Now my mom’s pincushion was filled with sand, but I’ve read that sand can dull pins. I picked up a couple metal door hinges for 89 cents each at the local hardware store to use as weights. Then I secured them together using floral wire. 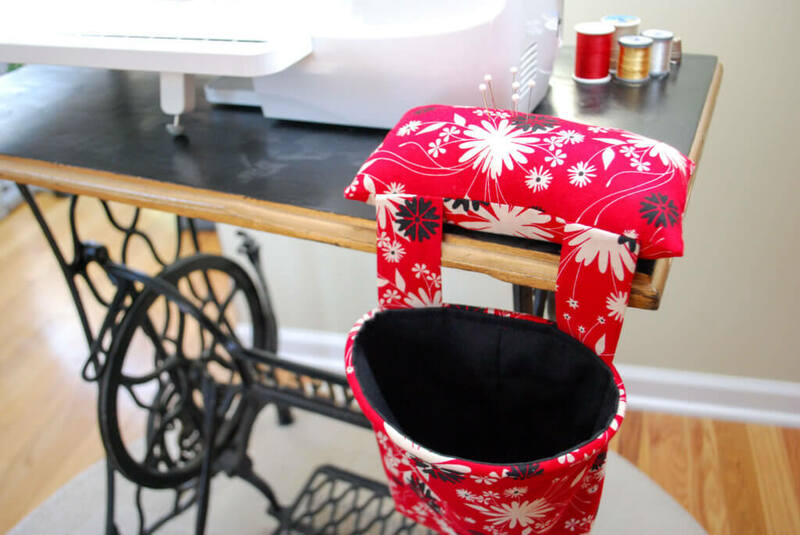 Slip the metal door hinges into the bottom of the pincushion – it will keep it from falling off of your sewing table even with a full basket. 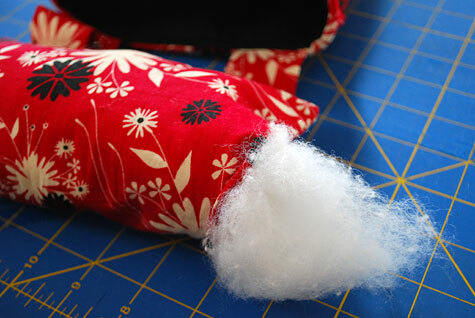 Stuff the pincushion with eco-friendly polyfill stuffing, keeping the hinges on the bottom as weights with the polyfill on top and on the sides. Hand sew the pincushion closed using a slipstitch. Hand sew the opening inside the bag closed using a slipstitch. Hi i am turkish. your handmade workings very nice.I am interested in sewing. I liked his ideas. My English is not very good sorry. This is smart and beautiful. Well done. Whoa… this is fantastic! Thank-you so much for sharing this. What a great gift! I’ll be linking. Thanks, Rachel! I love your site and appreciate the link!! Very lovely and functional too! I’ve seen these and think they are wonderful and so useful! I always move my trashcan right next to me, so how great to have it attached to the pin cushion! Great idea using hinges, too! I will have to dig though the garage for things I can reuse! I think I’ll be making one for myself and several others for gifts! Thanks for the great tutorial! Wow! What a great idea! That’s so convenient! I’m always trying to find a quick way to stash pins and throw away random piece of thread without making a mess. Love this! 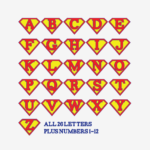 I like the buttons, and thanks for sharing the link. Where in Southern Indiana are you from? What? You mean you’re not just supposed to sweep your threads and scraps down on to the floor to deal with later??? This is brilliant! I was just thinking the other day while I was at my sewing machine that there ought to be a way to discard all the little threads without having an obtrusive trashcan sitting there (my sewing machine sits at my dining room table). This is DEFINITELY going on my “to make” list! Very nice idea. Love the one with the buttons added too, easier to empty the trash lol. This is exactly what I need! Thank you so much for sharing. This tutorial is very nicely done and I am looking forward to making this, and also to reading through the rest of your site. Thanks again for sharing! Thanks, Millie! I appreciate your comment and welcome your feedback on the tutorial when you use it. 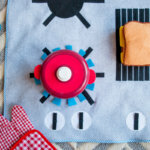 I checked out your blog and maybe I’ll have to dust off my serger and try it again …never seem to get the tension right. Thanks again! 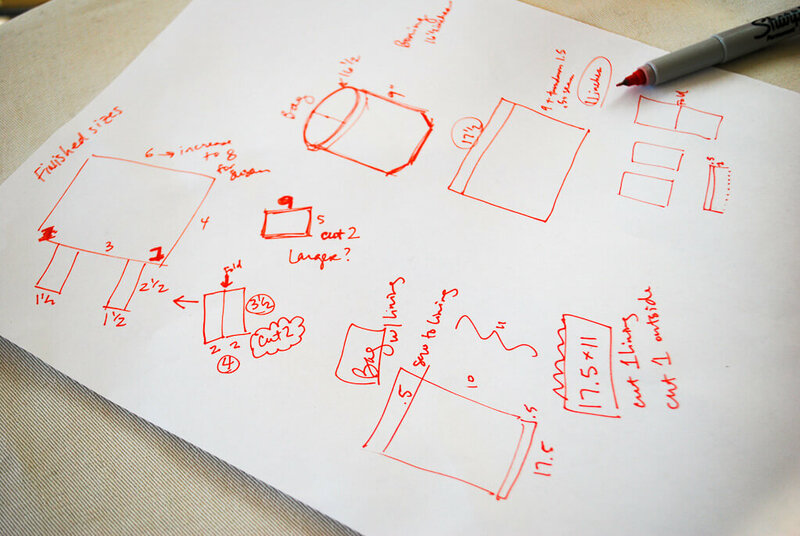 I love this idea, great tutorial too. I am going to make this for sure! I want to try one of these. it would work great to replace the gross one I have now. Thanks for posting this tutorial. I had one of these many years ago but somehow someone sometime got rid of it for me. I’ll be making one and let you know how it turns out. I also put a magnet on the pad for needles. Hi Charlotte, I love your magnet idea. Would love to see how you work that piece of it out. I made one of these last night and I love it. I didn’t have clothesline and didn’t want to wait to finish it so I used a cool whip container lid lip (the part that goes over the bowl to give the bag structure and keep it open. Works like a charm. Also used some pea gravel from the garden in a snack size ziplock bag for a weight. Just had to make sure to get the stuffing in pretty good so I dont try to stick a pin in the rocks. I have a smaller version and I believe this will work better. It does not look complicated and I think the larger size will work much better. Thanks for sharing. 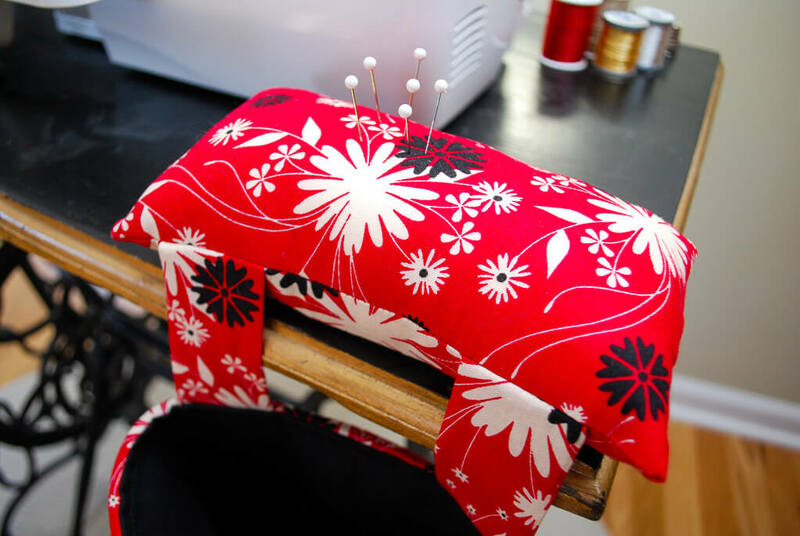 I have been unable to download the web site page with all the info on how to make the pincushion, which is darling. Is there someway you can send me the tutorial. Fine sand will not dull a needle or pin, but will instead help to keep it sharp. I have a very old pincushion that is filled with fine sand and it helps a lot to keep the pins in good condition. 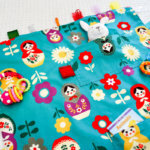 Ifyou want to include a magnet, I would make a removable one by glueing a round magnet to athe bottom of a large button and after sewing the bag, but before you turn it, use fabric glue to glue another magnet near the corner before you turn the pincushion. Then the magnet can sit on the corner of the pincushion and be right at hand. 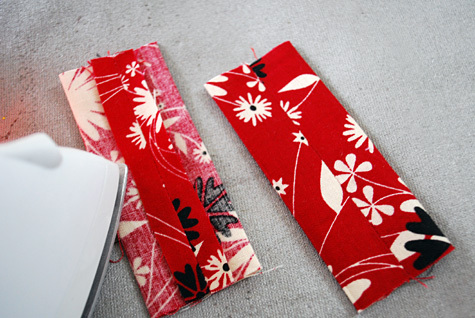 Or ifyou have a strip magnet, use that along the seam edge of the cushion. I plan on trying this when I get my machine back from the shop. Thanks for the tip, Toni. Do you have any suggestions of the best kind of fine sand to use? Happy sewing! I would imagine you could use that fine sand found in craft shops for those colored sand designs – you know the ones where you pour layers of colored sand in a clear container and poke it down the sides to make a design. Aquarium shops sell sand for marine tanks that is a bit finer, also..not the gravel for freshwater tanks as that may be a bit coarse. Also sand would provide some weight. I also had a thought that you could use the sand and add some of those glass rocks or even the pebbles that are used in vases and see if that woud add weight if you can’t get to a hardware store and want one right away. 🙂 Have fun. this is just about the best idea ever!!!! i usually just let my thread fall on the floor, but this looks much better. 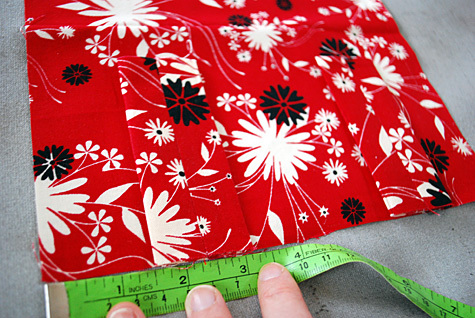 Your pattern calls for 2 – 9X5 for the pincushion piece. I only see you using 1 piece. What do you do with the second one. @Pat: Ack! It’s a typo. I have corrected it. Thanks for pointing it out and enjoy your pincushion! I am having a really hard time fixing the pincushion part. I just can’t figure it out. I cut it 9X5 . I really don’t know what I am doing wrong. It just doesn’t look like yours it is smaller. HELP!!!! Hi Pat, I re-read it and the issue is all me. You see, I was going back and forth about (1) cutting two rectangles for the pincushion and sewing them together or (2) cutting one large rectangle and folding it in half. I do these during my daughter’s nap times across days, and it looks like I wrote the “cut pieces” part for two rectangles but did the directions for one rectangle. Sigh. It is corrected now. So here’s what to do: Cut a piece 9×10 and follow my directions. 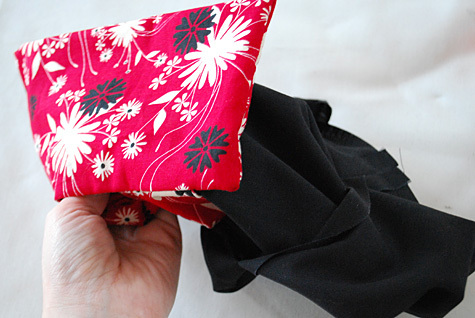 OR, if you’re running short on fabric, use your seamripper and unfold your 9×5 rectangle. 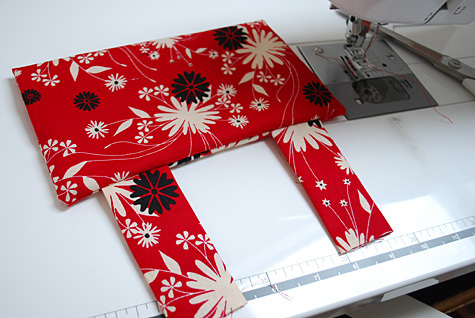 Cut another 9×5 rectangle and when you sew the side seams they will attach together. So sorry about the confusion and when you’re done, please share a photo with me via email or on Flickr at http://www.flickr.com/groups/merrimentdesign/ Thanks!! Thank you so much for this pattern! I made these for all my sewing friends for Christmas! Now, just need to make time to make one for myself:) Your directions are super clear, thanks for posting such good pictures along with it. 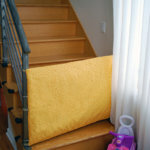 The only modification I made was that I used sand in the pillow instead of hinges. Thanks again for the useful pattern! heavier home dec fabric, so no lining was required. This is my first venture into cyber sewing, but I’m hooked. We cut the rope with scissors. Thanks. Love your tutorial. I received a similar one as a gift. It is smaller, but does the job. 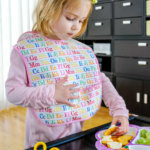 Mine has that “footie pajama” rubber fabric on the bottom of the pin cushion to keep it from slipping off the table. Will be making one using your pattern, but adding the rubber fabric. Thanks. 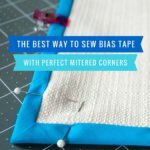 Found your website and used your pattern to make a thread catcher for when I go to scrapbooking classes! 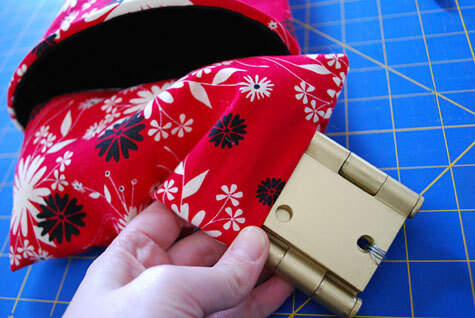 I love the fabric you used and who would have guessed – door hinges! I’m including this in my Friday Favorites this week! I love the fabric you used for this. And who would have guessed – door hinges! I’m including this in my Friday Favorites this week! funny way to weight ! I just made one of these for my mom for Mother’s Day. It was super quick to finish. The instructions were pretty good, as long as you used a bit of common sense and had a little bit of sewing experience. Your tutorial is excellent and so much fun! I just finished my threadcatcher / pincushion and I can’t wait to put it to good use. Thank you very much for sharing. Thanks so much for this. I was at a shop last week and I tried to buy this pincushion but was told it was not for sale. I would love to make it but I’m new to quilting. Is it difficult? It’s pretty straightforward – hardest part is probably deciding what you want to weight it down with. There are also some tips in the comments from other readers. Give it a try!! I just wanted to say THANK YOU!!!!!!! You did a GREAT job on the tutorial!! I’m a VERY VERY VERY VERY (did I mention VERY!?) visual learner and usually can NOT learn how to do things unless someone actually shows me. ADD to that that I’m BRAND NEW to sewing. I’ve actually taken one quilting class and done the one quilt that I just finished. I loved this project! It’s so cute and useful! Here’s a link to my Deviant Art page where I posted a picture. Thanks! I’m sewing one right now! if you’d like to see pics when I’m done check out my blog later on today!! I just found this and it’s EXACTLY what I’ve been looking for! I can’t wait to try it. Thank you!! Í liked the idea of a thread cather very much. So much that I made one for my own. I’ve put a picture of my version on my blog http://nynkestone.blogspot.com/2011/02/thread-cather.html with a link to this post. I made one of these today!!! I didn’t use the pattern just the concept. It was a re-purpose of a shirt that my daughter outgrew. I loved the print so much I knew I’d want to make something out of it. The sleeves were these wide asian type style perfect to make the rectangle for the pillow. I cut the shirt at the rib cage and made a square for the bag. The bottom hem became the top edge of my bag saving me that extra step. Next I lined the bag with a clear plastic sheet protector because I hate when threads stick to the inside!! Which also kept me from needing to put in any boning or wire to hold it open. Lastly I used the shirts ties as the straps. Fast, easy and oh so handy 🙂 I’ll post a pic!!! 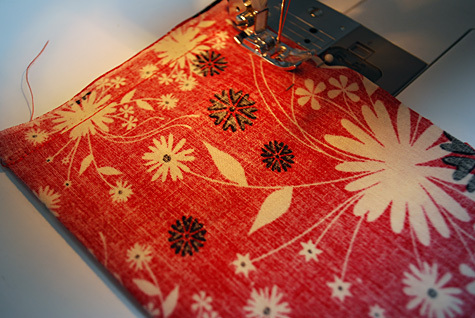 wow…just started another sewing course, and wanted a thread catcher! Found your pattern yesterday and just finished making my holder using 2 fat quarters in my stash. With not quite enough material to make a one colour pin cushion, I made the back to match my lining. Lined the pin cushion with muslin, and filled with rice. Raided my husband’s workshop and used a plastic cable tie around the top of bag. It wasn’t quite long enough, so I just put it around the back, sewing the ends shut at the front. It was 14″ long, and it holds the bag open with no problem! Thank you for this pattern! It is perfect. 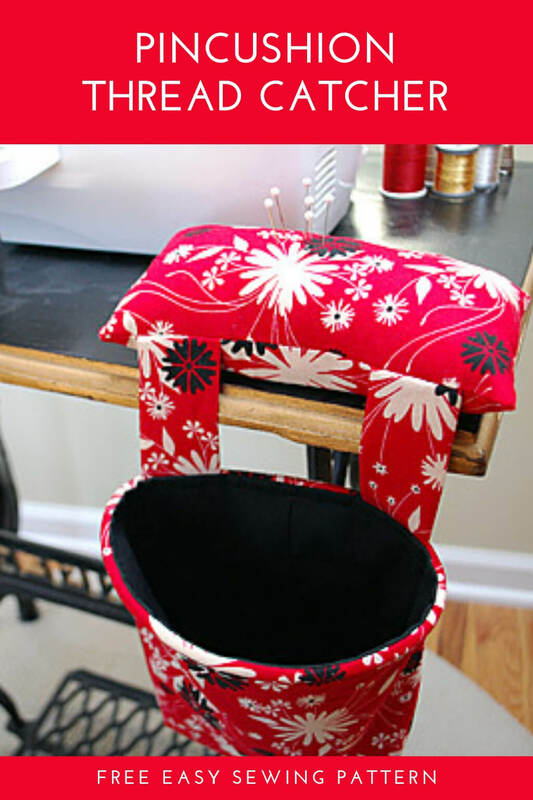 Thank you so much for your great tutorial I have a few sewing buddies that I will be making these for for Christmas. Thank you again. Exactly what I have been looking for! Made it up yesterday, used rice as a weight and funky fat quarters from my stash. Didn’t have enough to make pin cushion all one fabric, so back of pin cushion matches my lining. Thank you for the awesome pattern. Of course one just won’t do….now I need another for my knitting area to catch those pieces of yarn!!! Hi thanks so much for your free pattern. I love it and you are so generous for sharing. Thanks so much for this tutorial. I am certainly going to make one of these to put beside my sewing machine. I hate having threads all over the place! Thank you so much for this lovely tutorial. I found it yesterday morning and pinned it on my Pinterest board. 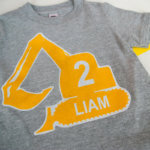 Seems very popular as its had lots of repins. 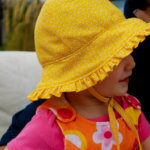 Hi Liz, glad you could use the pattern and thanks so much for pinning! What is your name – I’ll follow you. And if you want to tweet me a photo of your pincushion I’ll share it with my twitter and Facebook followers. Thanks so much for commenting! Many thanks for the Tutorial. I finished it today. I’m really pleased with how it turned out. Lovely idea, very pretty ans useful. I made myself a pincushions for the arm as a voodoo doll, is funny. Hope you like!! Thanks for sharing this handy (and easy) tutorial! I am basically a beginner and I was able to put this thing together in just a short time. I wanted to find something that was on the easy-side, yet I still had to think (it took me a little while to figure out the triangles for the bag bottom). Then I cheated a little and had my husband weld the hinges together for me rather than tie them together with wire. Worked out great! For the outside fabric I used Amy Butler’s Trumpet Flowers in Pink. As I said before, I’m a beginner (this was my very first project) so I don’t have ANY scraps yet, so I had to buy some new fabric. Love it! Hi – hope you don’t mind but I put a link to this thread catcher pattern & tutorial on the Friends of DMC Creative World Facebook page. 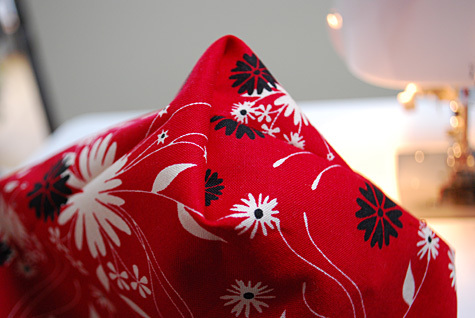 I loved the easy tutorial and the fabric is so bright and cheerful. 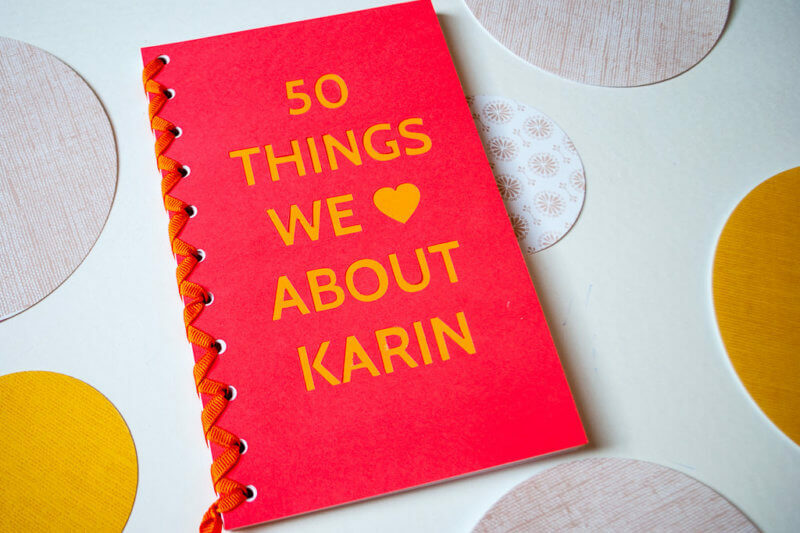 Hi Katrina, thanks, you’re probably right …and now I’d love to find some for myself 😉 I googled it and am not seeing where to buy so if you have any shopping suggestions please let me know. I made this today (my first sewing project!). Instead of using clothesline I used zip ties with the ends cut off and stickytaped them together. Im really chaffed after making this thread catcher. My first project since going back to sewing. I used the cable tie tip which worked a treat. I strip patched material from my old stash which turn out well. Thankyou very much for the tutorial. My daughter sent me this link and begged me to make it. I haven’t really sewn much and not for many years. I took the challenge! It really came together nicely. You directions were easy to understand. I didn’t have any clothesline but while I was digging around to see if I had any hinges laying around I found some flat speaker wire – it worked wonders. Now I think I will make a few more for Christmas as well as one for myself as I can use it for threads, etc when cross stitching or other projects! Thanks for the wonderful project! Instead of clothesline, I used plastic cross stitch canvas. You can also use template plastic. Used aquarium gravel in the pin cushion – no weight needed. Love this, strong parcel strapping – the sort used on heavy parcels – is ideal for the top of the thread catcher. Thank you for a great tutorial. I love this project and now have done it myself. I just blogged about it too. I am so happy with it. I have already started using it, right after I finished it, actually. Hello I saw this on Pinterest and just had to try it. I’m really new at sewing but was able to do this project. Thank you so much for the tutorial. Thank you for this tute. I made one as a birthday gift for a sewing friend this afternoon. I used a leftover cut tile…was just right size…wrapped it in batting then filled with polyfill. Works for me. Just finished making the thread catcher, your tut was very easy to follow, thank you! I used an old pocket from something I had taken apart and filled it with cat litter, a couple bolts …sewed the end up and wrapped in batting instead of hinge. Works great! I absolutely love your tut! VERY EASY to follow. I have been wanting one of these since I saw them 2 years ago when I was introduced to quilting! I really was glad to find your site and glad that you made it so easy to make! I may re/up cycle my older pin cushions into the pincushion part. I don’t want to dull my pins with gravel or litter. Thanks again for making this available! You are very creative! Wonderful !But I improved it a tad. I added emery sand to the pin cushion(this will weigh thepin cushion but most important emr sharpens your needles) Also I use an empy soda pop bottle about 10 oz. (cleaned and cut to fit the bag)this way I just pull out and empty when needed. Bottle should reach the top of bag emery sand and crushed walnut shells can be found at most large hardware U can also use crused walnut shells but emery sharpens best. I used rice in my pin cushion, and on the bottom of the cushion I used rubberized material like shelf liner, it gives it a good grip on the table surface. I do like your closeline boning better than the stuff I used. I read the instructions over and over and over again and was worried I’d screw it up. I spend a lot of time ripping out stitches in general.. lol… but this was super easy once I got started!! I just saved the project. First time I have seen this. I think it is a great gift to pass around at quilt retreats. I just may make a handful of these for our next retreat.. Thanks, Donna! Made my day to see your comment. So nice of you! Got this done w a minimum of difficulty! I used a really pretty bird fabric, and managed to get it upside down once! So my tip would be, think before sewing if you are using a directional fabric! I used a craft cord for the bag opening, which worked great, and I already had a spool of it. Not sure how I’m going to stuff the pincushion, I feel like rice might attract insects and sand would eventually begin working thru the fabric…. 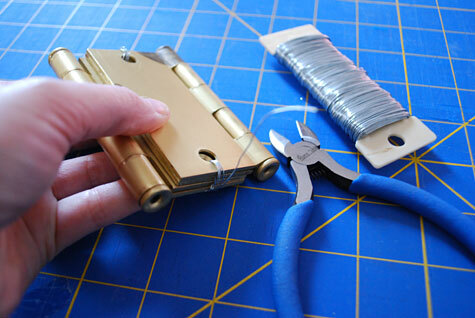 going to try hinges I think! Sure that the next one will go quicker than the first! Thanks! I used rice in my first one. I put it inside a snack size baggie. Perfect fit and won’t attract bugs. If I ever need to wash the bag, I will just reopen the seam and remove. I made this as my first ever sewing project and it took me about an hour and a half, I found the triangle quite tricky as I didn’t understand it at first, I did the first one and turned it out to take a look and then it became clear. 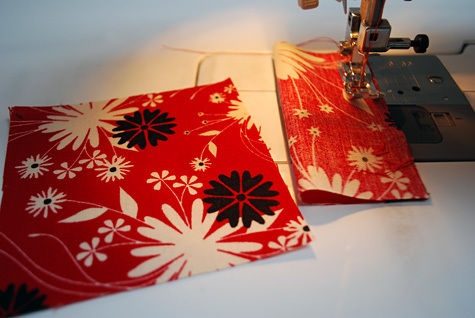 I did sew my straps the wrong way so they were long instead of chunky – but that was ok too as I just chopped a bit off 🙂 I am now moving on to make an apron – thank you for the instructions as I have some much needed confidence and practice. I will add the pictures to the facebook – mine was the Basset Allsorts fabric mmm yum! Hi Val, thanks for reaching out. 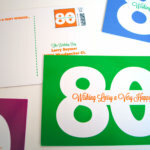 Were you able to print it from your browser? Some printers let you “print to fit” so it will go on a page. I am in the process of re-designing my blog and part of the redesign is adding a way for my tutorials to print more easily. Thanks for the feedback! I have one of these pincushion/tread catchers…and it is filled with white sand. It sits better and the sand helps to keep the pins more secure. It will hold more pins with the sand. Hi Rebecca, thanks for the tip about the sand. Did you sew it up? I’m curious how you did that with the sand, if it’s tricky or straightforward? Thanks so much for the pattern. I also found the triangle a bit tricky, but turned out okay. I made one of these today, 7/24/14. I used a rectangle sandbag covered in thick plastic, for my weight and an old thick computer cord instead of the plastic clothes line. It’s what I had and it worked well. I covered the sandbag in pretty red, black and white design cloth and the basket and straps as well and used black for the lining. I love it. 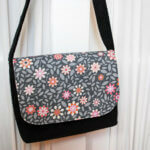 Hi Belinda, glad that the pattern worked for you! I like the sandbag idea, and using the computer cord is clever. If you’d like, please post a photo of it on facebook.com/merrimentdesign and I will share it with the group. I’d love to see it! Kathy, The easiest way to use the sand for the pincushion is: Sew the pincushion part all around leaving about a 1 1/2 inch opening. Pour in the sand through a large funnel…making sure it is almost overfilled. Then proceed to close opening with very close hand stitching. To be really secure…stitch over opening twice. I also used 3/8 in. flat boning instead of clothesline. It’s easier to sew the space first and then slide boning into the bag. 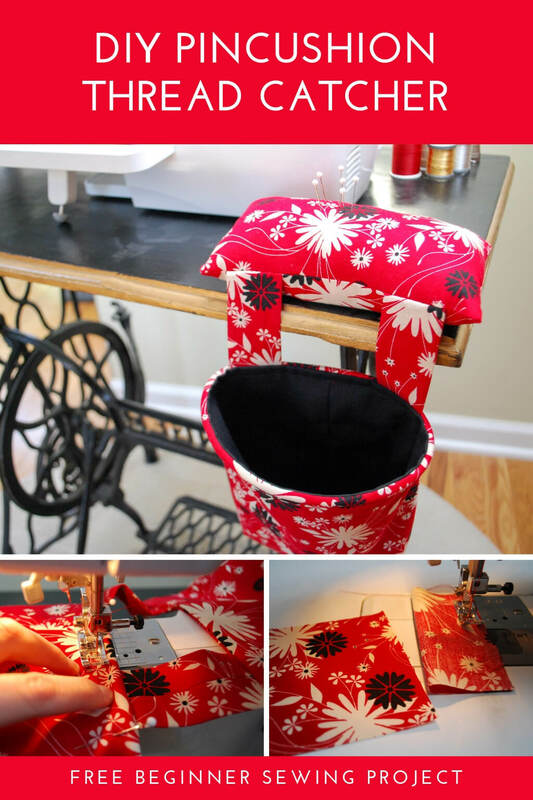 I found this pin cushion and bag are great and I use it with my serger, all my machines, etc. It sits on any table and does not get in the way…. Have one these made at a patchwork weekend. Had forgotten how to do it, so thankful when I came across this just now. Mine has wheat filling pincushion ) provides weight, & the pins don’t seem to object. Thanks for super clear instructions – grateful to have them again. I have been wanting one of these for so long. Was going to try it on my own but I’m glad I didn’t. Your tute is great and I’m going to try it. 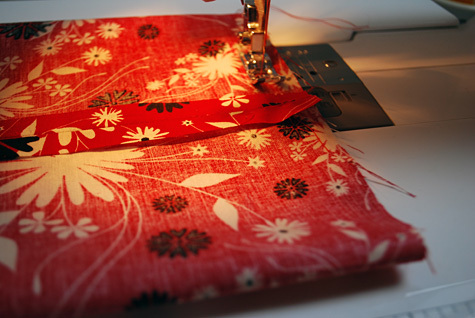 I have been sewing for 70 tears, started sewing when I was six. Right now I am making clothes for kids in the Dominican Repulic and loving it. I am going to take a break and make this for myself. Thank you so much you are very generous. Thanks for posting such a great tutorial. I am new at sewing and am teaching myself as I go. I found this project relatively easy and was extremely proud of my result. Thanks again! thanks for the great tutorial. Been wanting to do this for a while. Just finished it in pink and brown zebra stripe. I live in South Africa and found the fabric appropriate. Sunday afternoon project. Done. I just love your site! So many fresh and easy things to make. Могу продать аккаунты Mail.ru Mix S/H , Multimania.co.uk , Youtube.com Plus , Mail.ru Second Hand и подобные. магазин аккаунтов gmail , купить аккаунты aol.com , купить аккаунты вк онлайн , куплю mail.com акки , htfkcnfnec , yahoo.co.uk , купить аккаунты вк онлайн , магазин аккаунтов facebook , продажа акков одноклассников , куплю аккаунты вконтакте , купить аккаунты mail.ru , hotmail.com plus , акааунты вк онлайн , аккуанты http://loveplanet.ru , купить редиректы blogspot , куплю mail.com акки . I use sand for the pin cushion, but make an inner bag out of some left over cotton sheeting. It is safer this way as you would have to tear/cut through two layers before the sand leaks ;). Sand keeps your pins sharp. Also I used boning for stiffening the edge but the clothes line or cable tie is a good idea. I made a similar bag from a pattern I got from a resale source. It was a bit different. Had a weighted 5 inch square that the pincushion was glued to and a magnet strip glued between the pincushion and the edge. The attachment strips had velcro to attach the thread bag and plastic aquarium tubing was used to hold the top of the bag. I also made one without the pincushion and magnet to use under my serger. I used 4 to 6 large washers and then metal wood connectors for weights, both inexpensive by the package. I made a set of them for both of my daughters, need to make one with a pincushion for my grand-daughter. Still learning so cannot send photos. I made one of these for a class I taught at JoAnn’s Fabric yea about 2008. Used sand as my weight and cushion. Sand will keep your pins sharp and clean. Great idea. Thanks for a trip down memory lane. Great tutorial!! Just recently began sewing again after a 13 year break from it. I had forgotten just how much I love sewing. I finished it in about 1 1/2 hours and it will make a wonderful additon to my sewing room Love your site! Have made two of these but one has tubing and the other does not, both have rice in the pin cushion. Works well, the rice wicks any moistness away from your pins. Love the thread catcher cause I am a pig. 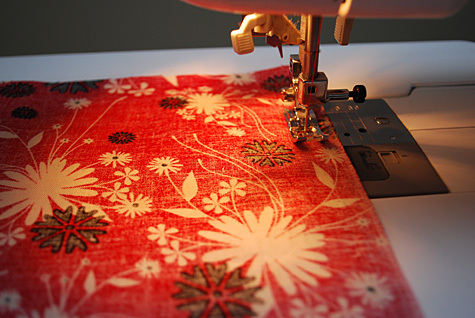 I am getting ready to make daughter-in-law some for her new sewing room. Thank you for this neat and easy pattern! Hi Bev, thanks for the feedback! I never thought of rice before, interesting and I’d like to try that. Thanks so much for commenting! Thank you for the pattern. Our quilt group of friends made these recently and we used a package of ground nut shells (12 0z. bag) purchased at a quilt shop, instead of sand. Also, one lady went to the pet store and purchased several dog leashes. She cut these into 18″ lengths for straps to go inside the thread catcher, instead of clothes line. We made a loop with the strap, overlapped it by 1/2″ on both ends, and sewed it a little. Her idea worked well, looks very nice, and the top edge can bend without breaking when we take our thread catcher to workshops. Hi! I am making one of these. The instructions are great but I would like to make a suggestion. Could you please add which sides are the sides and top? Something like, “put the long sides together for the top and the short side for the side seam”. I am having trouble deciding which sides to use as top or bottom and sides in the little wastebasket. Someone may have already posted that but I haven’t seen that anywhere as of yet. I featured your tutorial on my blog, click here to see it. Oh wow…the plastic clothesline idea is worth the pin alone!!! I’ve been using embroidery hoops from the thrift stores and they are starting to get hard to find in the right size!!! My girlfriend and I made these today from scraps. We didn’t have clothesline but did have some underwire from an old bra. We used the glass beads used by florists to give weight in vases. Worked perfectly. She made hers 17.5 x 9 as she wanted it a bit smaller. We r thrilled. Thanks for this flawless tutorial. I love using the hinges as the weight! When stuffing the pin cushion use steel wool. Every time your pin goes in. it gets sharpened by the steel wool. Thank you so much for the How To. Hi Linda, thanks for the steel wool tip! I didn’t know that so thanks and I’ll try that next time I make a pincushion. If you want to share your own creation, post a photo at facebook.com/merrimentdesign and I’ll share it with the group. I got this pattern several years ago, however with a few different steps. I used sand in the pin cushion so it was weighted with sand and used to sharpen and smooth pins at one time. It worked great. I have also enlarged for a friend that scrapbooks and it was real handy for her. I love the pin cushion with the thread bag attached. I forgot to add, I used the strapping that comes on postal packages. It worked great and gave the bag great support. I keep turning around to drop my thread in the trash can. Can you say pain in the you know what? I also use a small magnetic bowl for my pins as I pull them out of the material as I sew. This will work out just fine. I hear sand paper or Brillo pads will work as a sharpener. As far as weight? Maybe a small sack of crushed corn or rice with some fragrance to make it smell nice? Hi Jack, I love the idea of a magnetic bowl! Where did you get it?? Thank you so much for the threadcatcher pincushion pattern. I’m going to make one for myself and one to give away. Thank u once again. Looking forward to more patterns. Thank you so much for the pattern I made one and I love it. I didn’t use the clothesline boning but wish I had and will make another with the boning. But I still love the pincushion thread catcher. Thank you again. Just (almost) finished one of these as my first ever machine sewing project, still need to fill the cushion, but really pleased with how it turned out. When you say to fold pieces in half, you dont say which way to fold them, along long edge or shor edge? Not a major problem, but makes it a bit more difficult than it needs to be. Happy to send a pic, but I don’t do social media stuff. Looking for my next project, something practical, not into girly frilly stuff, any ideas? Thanks for saying that, Evelyn! Happy to hear that it worked for you! Wow is this a great project… I love what you have done. This is the first project I have made in 20 years! I am hooked on sewing again. Thank you for sharing and the tutorial is brilliant. Kay, I’m so glad that you’re sewing again! Thanks for your sweet words about the pincushion tutorial. I’d love to see it – you can post it at facebook.com/merrimentdesign or tag me on instagram (kathybeymer). What are you going to make next?? Thanks for a really great tutorial. 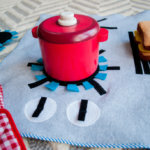 I am teaching someone to sew & this will make a great beginner project. The question is: do I use up some of the mountains of old leftover fabric & be economical or buy something really cute for my sewing room. We recently remodeled & replaced our hardware, using the hinges was pure genius as I have a whole pail of them. Sand versus stuffing dilemma. My favorite pincushion that I have had forever is stuffed with poly- fiberfill. I only use Clover quilting pins which are very thin. I stuff them at a fast & furious rate as I sew in my nice & soft pincushion. I have a firmer pincushion which often bends their very thin shaft, so I think I’ll pass on the sand. Genius move using the door hinges and plastic clothesline. Thanks for the tute! Thanks, Wanda! How did yours turn out? I just finished making 3 of these. Great pattern! After the first one, I decided it was a little too big for me. I cut the pincushion 7 x 8, and the bag 17 1/2 x 9, and the other 2 turned out the perfect size for me. Your comments about the stuffing were interesting and after doing more research, I decided the hinges and the fiberfill were the best option. The hinges fit perfectly even though I reduced the size. Great idea! I’d love to see your pincushions! I think the smaller size would be really cute on the sewing table. Thanks for commenting and being so sweet! You’re welcome! I tried to insert a picture, but I couldn’t get it to work. Loved this! Your tutorial was great and easy to follow. Thank you! Wish I could post a picture of the one I made today! Hi Jacque, thank you so much for telling me that you liked the tutorial! 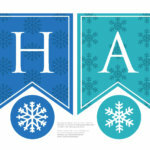 I would love to see your picture …I’d love to see your fabric choices and color combos. Are you on Instagram or Facebook? I’m at kathybeymer on Instagram Merriment Design on Facebook. I’m supposed to be working on a new dance bag pattern for my daughter. You’re motivating me to get to it! Hi Kathy! Thanks for the reply. I’ll tag you in a post on Insta!